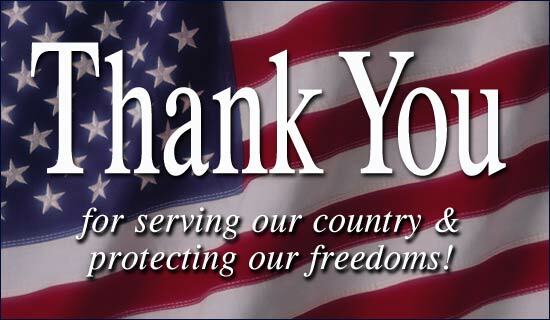 Thank a veteran if you see one…. We are fortunate to have a strong military that protects our borders and the way of life the pioneers dreamed of and for which they fought. We are fortunate that when we hear a loud boom walking down the street, we most often think of a car backfiring, not a bomb. With the election still fresh in our minds we are reminded just how fortunate we are to have the ability to voice our political opinions in a safe and civilized forum without fear of repercussions or fear for our lives. We are fortunate to freely choose to worship where we like and if we like. We have the fortunate ability to freely go to a store and buy the goods our families need without fear. We are Americans. We are fortunate. Thank a United States serviceman or woman. No matter what your political leanings are, be it left or right or somewhere in the middle, tomorrow is your chance to let your voices be heard. It is also a chance to honor those before us who went through great sacrifice to insure the rights for every woman and every African American have the right to vote. I encourage all of you to go to the polls and cast your ballot. Take some time today to count your blessings and say a prayer for those who were hardest hit by Hurricane Sandy- not only in our country but also the Caribbean. Having lived through Hurricane Andrew back in the 80’s in South Florida, I recall the news called attention to it during the storm and for the few days of aftermath, but the headache and heartache of losing your home continue on for weeks and months, long after the rest of us have moved on with our lives and forgotten. My son said to me last night, “Mom, I hope the kids in New Jersey and New York went to stay with someone at their house so they can go trick or treating.” We hope and pray that you your lives return to normal sooner rather than later and our thoughts are with you. Video interviewing is going to become much more common than telephone interviews and many people do better “in person” than on a telephone so you could also suggest a Skype interview to the person you are interviewing with. If you don’t have a video camera on your laptop, Logitech makes a great inexpensive video camera that plugs into your computer with a USB cord. Once you get over the pain of seeing yourself on camera, they can actually be fun! And the number one way to NOT get hired on your next job interview……. While this is obviously a tongue-in-cheek list, there are many do’s and don’ts when seeking your next job. Common sense appears to have been retired and as a recruiter, I hear and live some of these “off-the-wall examples. The obvious ones are turn off your cell phone or better yet, leave it in the car. Don’t ask questions about salary and benefits on the first interview and show up a few minutes early in professional attire. Read as much information about the company on their website, LinkedIn pages or blogs so you are prepared to comment on a recent accolade and be prepared to ask thoughtful questions about the company and the position you are interviewing for. Send a thank you (email or handwritten note ) after the interview and you will be head and shoulders above 70% of the other applicants. In the United States we are not accustomed to seeing loads of personal information on a professional resume as is the case in Europe and other parts of the world. It is not atypical for a candidate to put a photograph in the corner and include marital status and birthdate including***GASP*** the actual year. With the laws we have in place to discourage discrimination in the workplace based on race, age, gender, etc., it is not necessary to include this information and in fact, I recommend against it. So what things should you leave OFF your resume? Resume Tip: Less Is NOT More! The argument wages on. I just had this conversation with a candidate yesterday with 25+ years of experience and a very short, one-page resume. Should your resume be limited to one page or should it be expanded with more detail? As an executive recruiter focusing in technical areas such as information technology and engineering, less is not more. If you have been out of college for more than five years, it is crucial to list detail and depth to your resume. Many industry “experts” accuse recruiters of having short attention spans so therefore recommend you limit your resume to highlights and summaries all on one page. Your resume should be more heavily emphasized with experience details in the past ten years of work experience. If you are going to cut or shave anywhere, make it in your early career. List all relevant software/hardware utilized in each job, not in a big skills summary. They will be able to see you haven’t touched SQL in two years or they can clearly see that you have build experience with Epic Ambulatory in your most recent job and not in the distant past. Please toot your own horn with an accomplishments section or bullet point under each job listed for something that you did that was notable, saved money, created a time-saving process, etc. List all certifications early in your resume such as ‘Cloverleaf Certified’ or ‘NextGen Certified Professional’. This will heighten your chances of a recruiter or hiring manager seeing the information early so they don’t delete your resume and move on. If you are just too scared to extend your resume beyond one or two pages, create a project list as a separate document and send with the resume. Less is more when it comes to jewelry, makeup, and cologne, but it is the express opinion of this recruiter that it does not when it comes to marketing yourself and your skills with a short resume.